Sue Jackson was delighted to be part of a research trip to Cuba organized by the American Institute for Conservation of Historic and Artistic Works in early 2014. Over twelve days this group of American conservators met with Cuban conservators, architects, and preservationists working throughout the island on various projects from architecture to paintings conservation. They also visited seven of Cuba’s eight UNESCO World Heritage Sites. 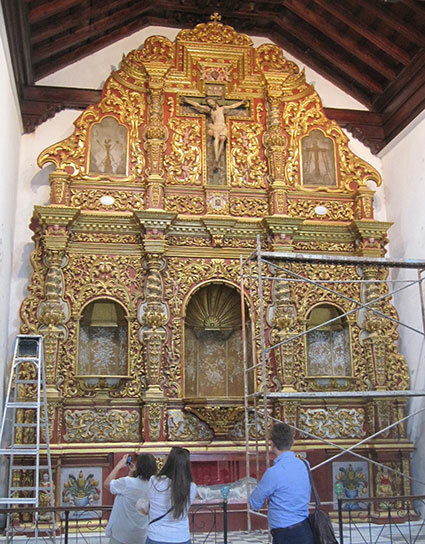 One of the largest carved and gilded objects Sue saw on this adventure was this altar piece from the Chapel of Our Lady of Sorrows in Bayamo which is being conserved/restored by a group of Italians and Cubans.